For as long as I can remember my dream has been to visit Paris and see where my idol Coco Chanel got all her inspiration from. Well I have news for all you stylelista's out there, I am finally getting the chance to visit Paris, and London, this Summer with my family! I am beyond excited words can't explain it! Now I thought since Paris Fashion Week is currently happening this was a perfect time to display my favorite designers that have shown so far and the extraordinary designs they have debuted. Of course a common theme, at least with Christian Dior, was Alice in Wonderland and with Balenciaga bright colors and geometric shapes was common! 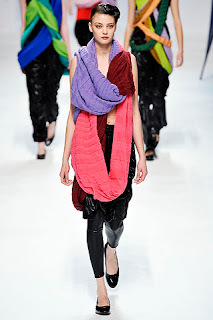 Issey Miyake as usual never disappointed me with his outrageous designs that are so incredibly fashionable in my opinion! Lanvin displayed feminine power through nudes and blacks and staple pieces. Even Vivienne Westwood made a mark with her crazy out there designs that made us all say wow! I can't wait to see what my other favorite designers debut during the rest of Paris Fashion Week! !